Core Cast is a comedy podcast hosted by Matt Burgess, Spence D’Mann, and Surfdudeboy. We primarily discuss gaming topics and entertainment industry related news. Matt, Spence, and Robbie return for episode 68 of Core Cast after a year's hiatus! Join Matt, Spence, and Robbie as we return for Episode 67 of Core Cast! In this episode we recount the various events of the year and try to catch up with all the happennings! Join Matt, Spence, Robbie and special guests Adelle Udon and DarkChiron! This week we'll discuss all things Fallout! A big thanks to Adelle for making our awesome thumbnail this week! Please check out Adelle and DarkChiron's pages! Episode 64 - Exile on Spence St.
Join Matt, Spence, and Robbie in Episode 64 of Core Cast! Join us as we talk about Fallout 4, Netflix, and many other topics! 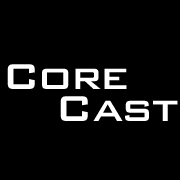 Core Cast is a comedy podcast hosted by Matt Burgess, Spence D'Mann, and Surfdudeboy. We primarily discuss gaming topics and entertainment industry related news.